My CrAp ShEEt: oh dear, selamat hari raya! oh dear, selamat hari raya! I hope it is not too late for me to wish my CrAp ShEEt readers *ehem* Selamat Hari Raya Aidilfitri, Maaf Zahir & Batin. If my writings have offended you in one way or another, I humbly seek forgiveness. I hope you had a good celebration with your family and loved ones during the loooong break. 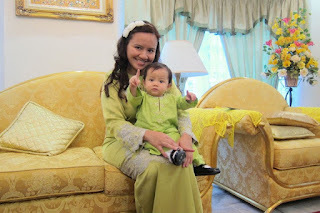 I sure had a great time as this is the first time I celebrated raya as a mother. It is also Babycakes' first raya ever. Alhamdulillah, thank you Allah for the blessings and for giving us this opportunity to celebrate raya as parents. It is a bit tiring having a very active baby on your hands but it is most enjoyable. Babycakes' behaved herself most of the time and only gets cranky when she's sleepy or hungry. She gets a lot of angpau too! I haven't counted them yet as raya is not over. ;) Thank you to everyone who has given Babycakes her duit raya. They'll definitely go into her savings account. Some sneak peek of our first raya pics. 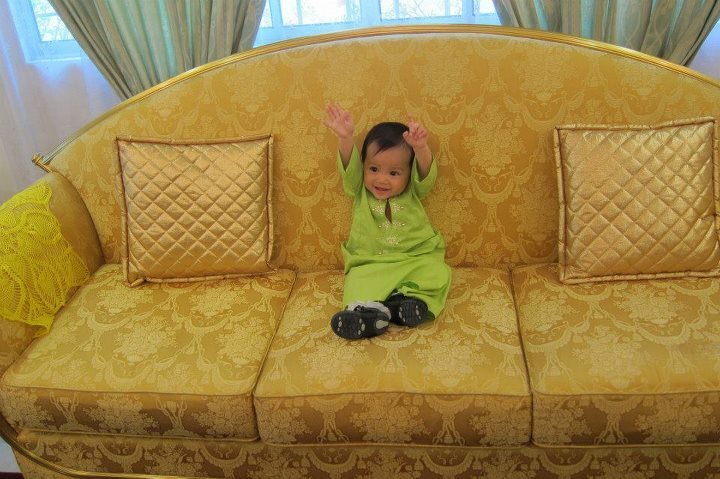 Babycakes telling the world that it's her FIRST raya.